Shred the sweet potato using a cheese grater. Or, to you can also cut the potato into quarters and shred it in a food processor. On medium-high heat, heat a 9-10-inch skillet with the oil. 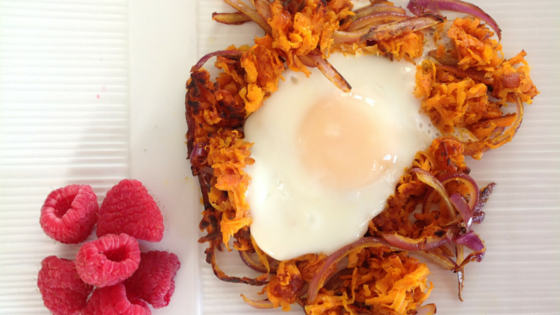 Once the pan is hot, place the shredded sweet potato and onion into the pan. Stir frequently until tender and golden brown. This will take about 10 minutes. Evenly spread the sweet potato around the pan and create 4 small wells for the eggs. Crack the eggs one at a time into each well. Reduce heat to medium low, cover and let cook 5 minutes until the eggs are cooked to your liking. Use a spatula to portion it off into four servings and enjoy.